As the image shows, geothermal uses the ground’s energy derived from the sun to heat and cool your home. Unlike outdoor air temperatures, the ground remains a consistent temperature all year long. What does this mean? When it’s summer and you want to cool your home, traditional air conditioning systems move heat from inside your home to outside. It is tough on your air conditioner to move heat into the already hot outdoor air (it could be 90 – 105 °F outside), and it takes a lot of energy for your traditional cooling system to do this as the hot outdoor air is not very accepting of more heat. By comparison, geothermal systems move heat from your home into the much cooler earth (usually around 52 °F), which is much more accepting of heat. Because moving heat with geothermal is much easier, it uses less energy, which means your home cooling bills are lower. But as you may know, heating your home during cold weather is even more expensive, as the temperature differential is even greater in cold weather (can be -15 to 30 °F outside) and home heating requires traditional heating systems (aside from standard heat pumps) to burn fuel to generate heat. For heating your home with geothermal, the process is reversed and the geothermal heat pump system moves heat from the ground (still 52 °F), which is heated up more by the heat pump and then blown into your home. Thus, you can save even more on your heating bills using geothermal. 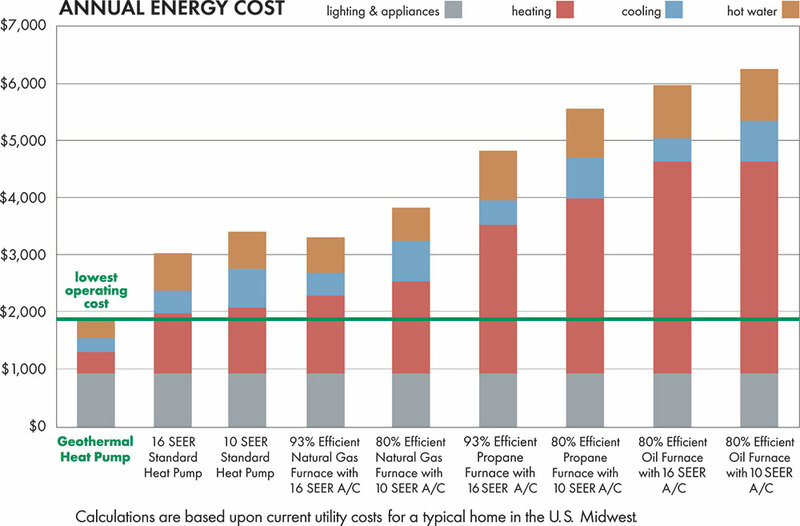 Use the table below to see how much you could save with geothermal compared to the system you currently use. Because geothermal systems are so good for the environment, the U.S. & state governments often have tax incentives in place to make geothermal even more popular. For more information, visit our Tax Credits & Financing page.